While this section on Faith is not part of the Anna’s Gift Foundation, it is an integral part of Anna’s story – the story of a mother and her daughter. This is our story – Anna’s and mine – to share with everyone – believers and non-believers. The hope is that it will bring comfort and healing. 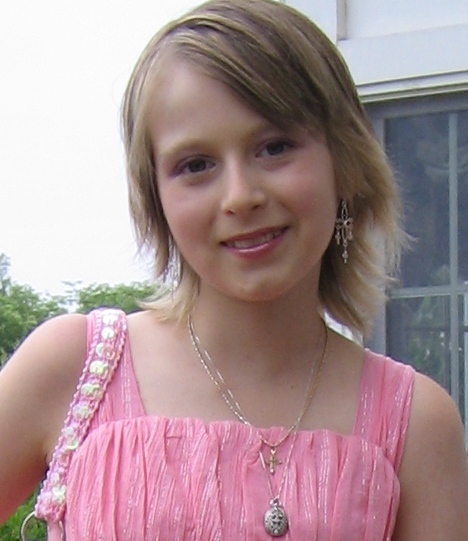 This is a story of faith, one that grew despite (or in spite of) the difficulties of Anna’s cancer and passing. There are many different facets of faith and we are all on our own journey to find the truth. This then is part of our story. Through Anna’s illness and after her death, the faith we had grew stronger and more complete in the knowledge of God’s love. While I had believed in God all along, I did not have an intimate understanding of Christ or who He was. Anna’s illness was a journey guided by heaven, the Holy Spirit and the hand of God to help me understand what I did not know. During Anna’s illness, her faith grew too, as together we discussed death and eternal life. Our priest would come to visit us in the hospital and at home. We absolutely loved him, and he was there for us when we needed him. Anna enjoyed his visits and talking with him. Our experience was a bit different though, as faith grew in spite of the suffering. Our Christian faith tradition is Catholic, and I am a baptized and practicing Catholic. During Anna’s illness, God developed/gave the grace of a strong devotion to the Blessed Virgin, the Mother of Jesus Christ, of which I discussed with Anna. It brought her great comfort. I talked with Anna about the three little shepherd children at Fatima, Portugal. The Mother of God had appeared to these little children in the early 1900’s. Two of the children were told by the Blessed Virgin that they would go to Heaven soon. They were so overjoyed to know this! I started discussing this with Anna. Anna understood and felt how intensely I loved her, and how good it felt to her when she felt the love of us together. We were very close. So when I told her that Jesus’ mother, the Blessed Virgin Mary loved her infinitely more than I could ever love her, she was amazed. She believed me and had complete trust and faith in this. As we continued to discuss this very point, she understood even more that whatever happened to her, she would be loved in Heaven so much more than I could ever love her on earth. Unknown to anyone, I started praying the Rosary every night, as Anna lay at my side. The Rosary beads that I used were given to me by a friend. The beads were from Fatima. My friend had kept these beads, to give to someone as a present, at the right time. That someone, months after her visit to Fatima, happened to be me. In the Catholic faith tradition, we believe that the Blessed Virgin Mary, the mother of Christ, brings others to Christ, her son. I believe that this is what happened to Anna and to me. Mary, Christ’s mother, brought Christ into the world, and her job in Heaven now is to bring all souls to know Christ. She is the bait that God uses to catch the fish – of human souls. Her sweetness, kindness and love are irresistible! The Blessed Virgin was the way for me to come to know who Christ was. As I watched Anna suffer through the many trials she would have to undergo, I came to understand and love Mary, as she had to endure the same suffering I did. She was a model for me. It was she then, and the help of a priest, who opened up my eyes that enabled me to accept who Christ was. It is no mistake then, that Anna died on August 15th – the day that the Catholic Church celebrates the Assumption of the Blessed Virgin into Heaven, and by a fluke at the funeral home, Anna had to be buried on August 22nd, the day the Catholic Church celebrates the crowning of the Blessed Virgin “Queen of Heaven” by Her Son, Jesus Christ. These two events, plus others that happened while Anna was sick – through prayers and seeing God’s hand intervene, helped open up the pathway to Faith, one that is available to any human soul. It has been said that once one knows Christ, and who He is, once a person has a “relationship” with Him, then everything in that persons’ life becomes different. It becomes, in fact, one of the most precious things in a persons’ life. It is written in the bible that when one finds a pearl of great price, one will sell all that they have to get it. I believe this is true of faith in Christ – such love occurs between a human soul and God that the soul does everything it can to reach out to obtain such a treasure. I believe it is this treasure then – this love relationship that a soul is allowed to share in with God, that provides comfort during the difficult moments, and solace in heartache. Today, I am able to share this story, to thank God for His incredible faithfulness, goodness, kindness, mercy and love, in spite of my incredible unworthiness, and at times, downright rejection of Him. Through Anna’s death, although tragic and horrible, which at times still makes my heart skip a few – He – the God of the universe – has shown me the way and given me an understanding and love that I am not sure I would have had if these events had not taken place. I do believe God brings good out of all things, and so I believe that God has brought good out of Anna’s death – not only by the foundation of “Anna’s Gift”, but also by my being able to share my God with you, who I know to be faithful and trustworthy and filled with an incredibly tender love, not only for me, but for you too. I hope if you are struggling with your faith, whether you have a child who is ill or not, that you will take the time each day to ask God to help you find Him through it all. You do not need to talk out loud. God knows the desires of your heart. Ask Mary to help you find her Son. You may not want to talk to God or Mary sometimes. Do it anyhow. Even for a second. It might just change everything.